A larger strainer than the Hawthorn and it's 4 ears gives it greater stability. Place it on top of your cocktail shaker and pour straight into the glass. 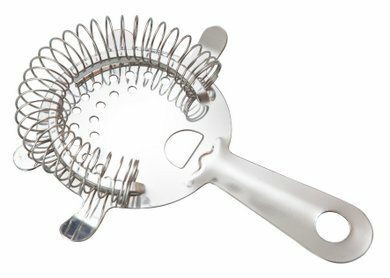 This strainer will defend your cocktail from those nasty pips and large pieces of ice. Designed to be used with cocktail shakers with no built in filter. 4 'ears' for stability and to prevent spills. Ideal to use with cocktail shakers with no built in filter. We advise customers that stainless steel is not completely 'rust-proof' - it will resist rusting but if left in contact with water for long periods it will start to corrode - so please ensure each evening that you wash-up and dry your equipment. Do not leave sitting on wet surfaces overnight or it will rust.